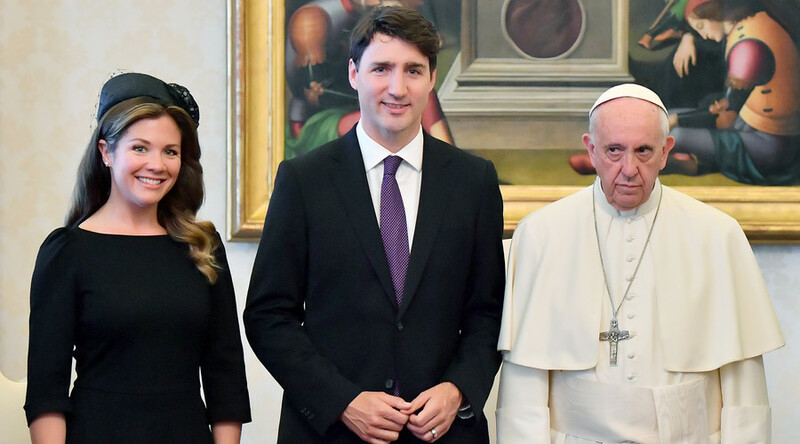 Twitter users are trying to figure out what’s eating Pope Francis after he yet again failed to crack a smile during a photo call – this time with Canadian Prime Minister Justin Trudeau. Trudeau and wife Sophie visited the Vatican Monday, and photos of the event suggest the pontiff was less than impressed with the photogenic PM. The Pope’s sour demeanor is the latest in a string of miserable showings by the 80-year-old when photographed alongside visiting dignitaries. Twitter went into meltdown last week when a photo emerged of a stern-looking Pope standing beside a grinning US President Donald Trump, as well as black-clad Melania and Ivanka, after the First Family’s visit to the Vatican. The Twitteratti presumed this was because Pope Francis had a particular dislike for Trump’s brash antics, but now a similar snap with Trudeau is prompting some to suggest that maybe the issue is with the pontiff himself. It’s unlikely Pope Francis will claim the nickname of his predecessor Pope John Paul I, known as the ‘Smiling Pope’, any time soon. During Trudeau’s visit, he asked Pope Francis to visit Canada to apologize for decades of abuse suffered by indigenous children in Catholic Church-run schools.